SBMI would like to wish everyone a happy and healthy holiday season. The university will be closed Dec. 24 & 25 and Jan. 1. SBMI will be open on Dec. 28 through 31 with limited hours and limited staff so please call 713.500.3900 if you need any assistance during those days. Assistant Professor Peter Killoran, M.D., M.S. was named the Director of Medical Informatics for the Memorial Hermann-Texas Medical Center (TMC) Campus last month. In his role, Killoran will serve as the physician leader for the management and support of the professional use of Memorial Hermann’s EHR. On Dec. 14, SBMI hosted its fall 2015 poster session in the Fayez S. Sarofim Research (IMM) Building. 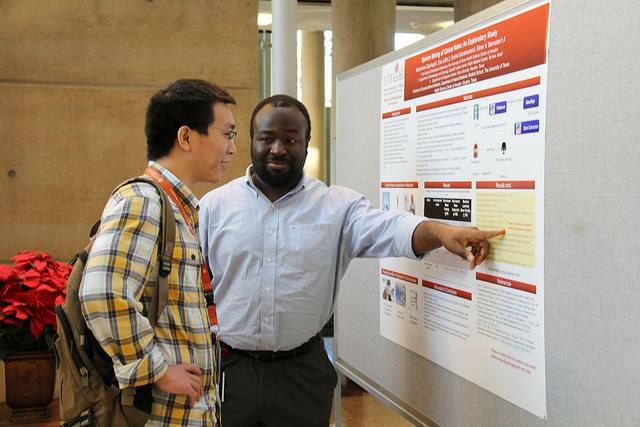 29 student posters were presented and the distinction of best poster went to master’s student Adetomiwa "Tom" Oguntuga. Tom’s poster is titled “Opinion Mining of Clinical Notes: An Exploratory Study” so please congratulate him on winning the fall 2015 Paul C. Boyle Award for Excellence in Research. SBMI is currently accepting applications for several scholarships to be awarded for the spring 2016 semester. To apply, please submit a current resume or CV and a one-page essay justifying why you are deserving of a scholarship. The essay should address the considerations listed above and be single spaced using 12pt font. Please submit both documents via email to SBMIAcademics@uth.tmc.edu by close of business (5 p.m. CST) on Jan. 4, 2016. All submissions must be electronic as paper submissions will not be accepted. The submitted documents should be in one PDF file with the student's name in the filename. Jorge A. Ferrer M.D., M.B.A. is an adjunct assistant professor with SBMI and was recently appointed to the Federal Advisory Committee Certified Technology Comparison Task Force. The 10-member group, which was created by the Office of the National Coordinator for Health IT earlier this year, provides recommendations on ways to create a new certified health IT comparison tool that providers can use to help them choose EHRs. In addition to his appointment on the task force, Ferrer is a biomedical informatician with the Veterans Health Administration Office of Informatics & Information Governance. While on a trip to Australia, Associate Professor Robert Murphy, M.D. discussed clinical engagement with the North South Wales (NSW) Ministry of Health eHealth team. His commentary was featured in the eHealth newsletter. Professor Dean Sittig, Ph.D. was named to the HealthData Management's top 50 list of health information technology experts. Sittig also commented on the importance of making e-health record systems compatible in a recent HealthcareInformatics.com article. KTRH recently interviewed Associate Dean for Research & SBMI Professor Elmer Bernstam, M.D., M.S.E. on the accuracy of online health information. Assistant Professor Peter Killoran, M.D., M.S. discussed the workload aging anesthesiologists have in a recent AnesthesiologyNews.com article.